Levi is a theater director, activist and co-founder of the Spanish digital democracy group Xnet and of 15MpaRato, a citizens’ device to bring to court those responsible for the economic crisis in Spain. Harrington is professor of Hispanic Studies at Trinity College in Hartford, Conn. and author of Public Intellectuals and Nation Building in the Iberian Peninsula, 1900–1925: The Alchemy of Identity. 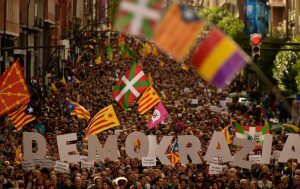 “For most of the years since the ratification of the Spanish post-Franco Constitution in 1978, the matter of independence was a non-starter for a broad swath of the Catalan political establishment.